Also know as Horse Shoe Shims, the bucket of shims contain packets of the full range of Window Packers. Each size has 50 pieces in the bucket. Bucket also acts as a great storage for the shims, as it has a sealable lid. Bulk packs for each size is also available. Product is made in Australia. 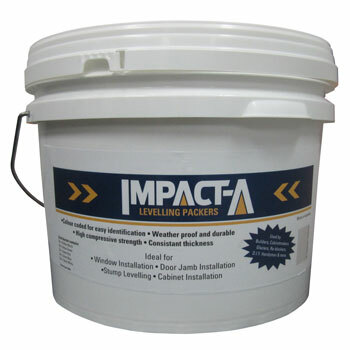 To buy IMPACT-A Packers - Window Packers in Bucket, please use the Store Locator below.